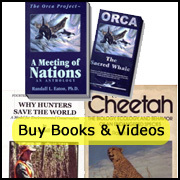 Dr. Eaton's article in Carnivore Journal 1979: special supplement on whales and whaling. Dr. Eaton presents a lecture program on "Talking whales, thinking animals? The problem of human consciousness." One of Dr. Eaton's student interns from Evergreen State College tape recording Logosi at the Vancouver Aquarium.